Online influence can take on many forms, is developed after first establishing a baseline of trust in the information delivered, and is reinforced after multiple successful interactions. As part of the POPSUGAR Insights "Find Your Happy" study, we asked women to share what they felt were the most influential sources of information in fashion, health and fitness, food, and parenting content. Overall, 60% of women cited social media as the most influential platform. This was especially true of younger demographic segments like teen girls (71%) and women 18-24 (67%), but less likely for women aged 35-49 (40%). Social media edged out individual topic area experts (58%), blogs (55%), company or product websites (54%), and lifestyle content websites (53%), all of which were seen as influential by at least half of the women we surveyed. Blogs ranked second overall to social media for teen girls (61%), younger millennials aged 18-24 (65%), and millennial women overall (59%). 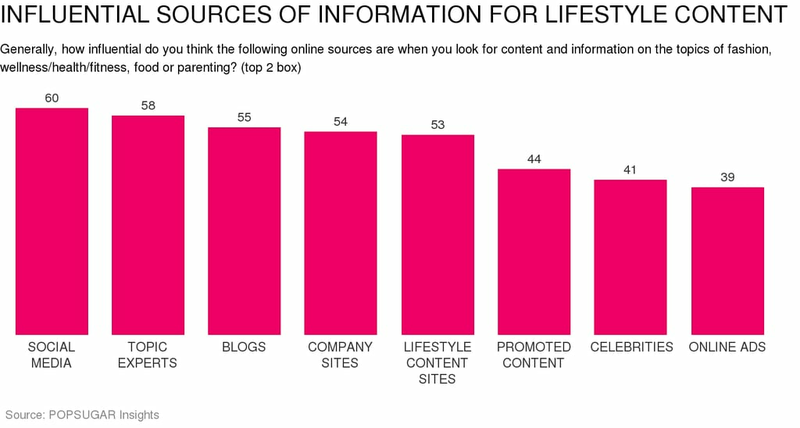 Lifestyle content sites were seen as especially influential for moms (61%) and Hispanic women (61%). Other influential platforms included promoted, sponsored or native content (44%), celebrities (41%), and traditional online ads (39%). However, brands looking to align with celebrities should be aware that celebs are more influential to teen girls (57%) than they are to adult women. Sponsored content is seen as more influential to moms (50%) and Hispanic women (52%).